Self Assessment is very important to groom yourself for future aspects of life. Whether we are students preparing for our exams or bank clerks aiming for a promotion; we all need to continuously assess ourselves for a promising future. 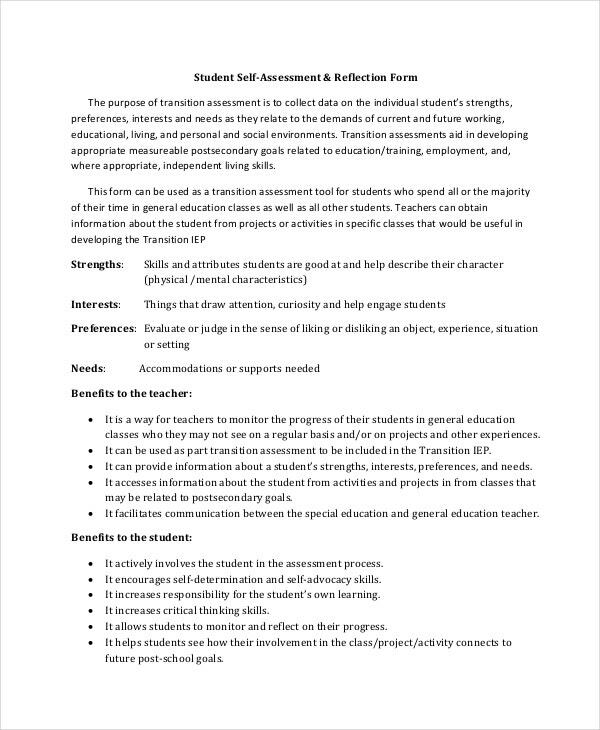 Self Assessment template is an important tool in your pocket that helps you achieve your goals. 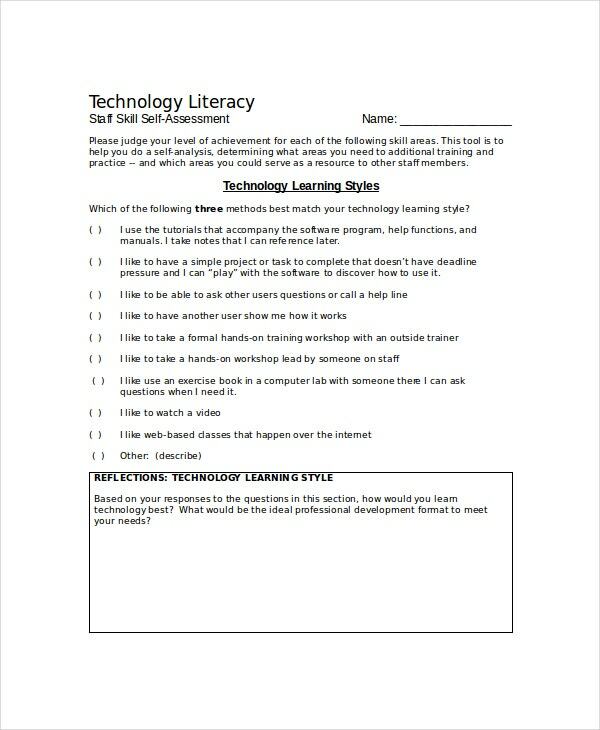 These templates help you organize your thoughts and plan of action which help you improve your performance.You can also see Assessment Templates. 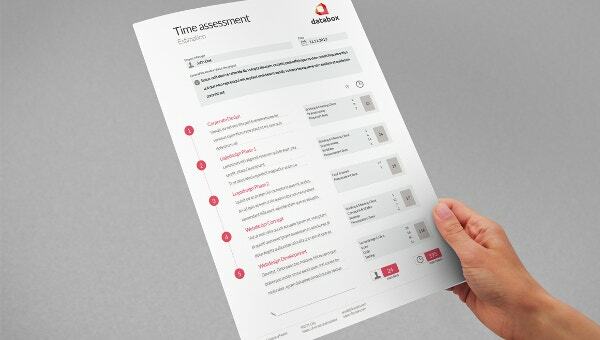 When it comes to scoring good marks in exams or planning your career path, this template helps you evaluate yourself better and help you make plans for a better future. 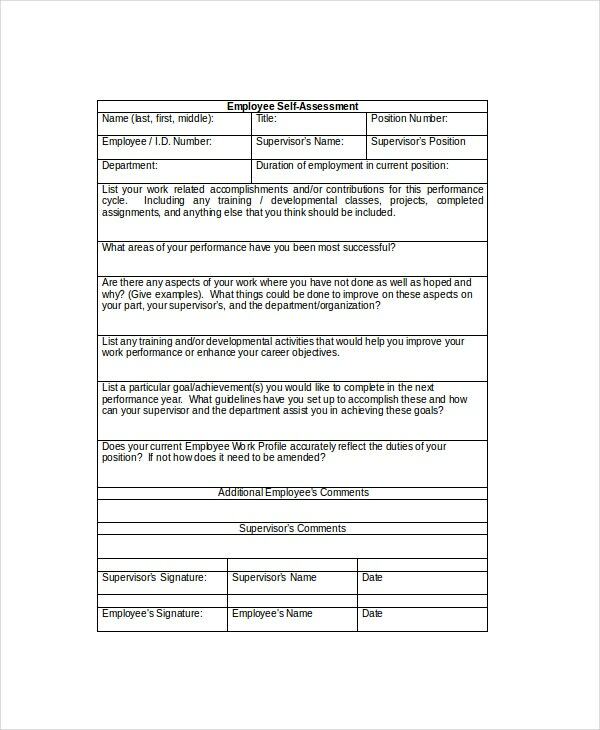 Employee Self Assessment Template helps assess your strengths and weaknesses as an employee and helps you in selecting the areas you need to work on in order to increase your output. Risks are unavoidable and sudden which makes risk management an integral part of project planning. This template gives you the foresight to detect future risks and helps avoiding it. Even professionals need to assess their performance regularly in order to maintain the quality of their work. This template helps the professionals to assess their work and helps improving it. Career planning is the most important thing every person should do. 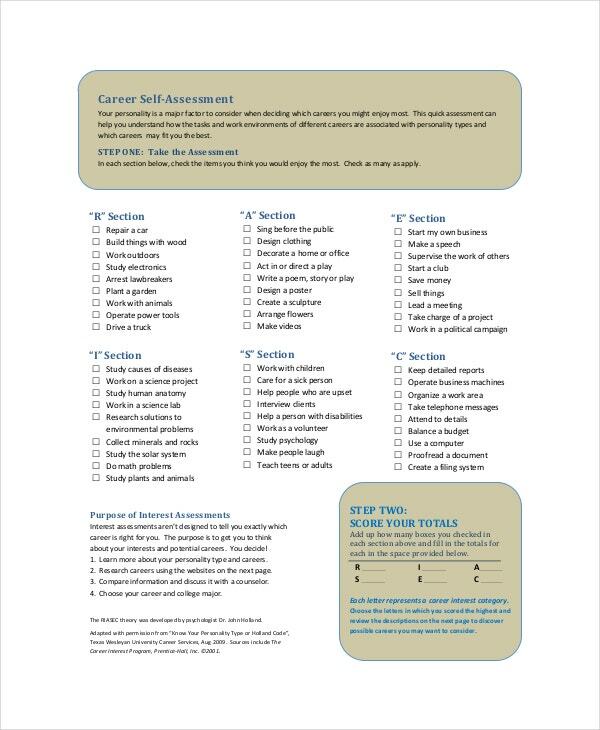 Career Self Assessment Template helps you assess your strengths and helps you choose a better career or improve the existing one. Assessing yourself helps you evaluate your performance and achievements and pin point your weaknesses. This assessment helps you in improving your performance and productivity. It helps you to determine your potential and push your goals accordingly. Knowing yourself better helps you in deciding your future career and goals. It helps you to manage and reduce the unknown future risks. Self assessment helps you plan better which keeps you a step ahead of you competitors. It protects you from the risk of being under paid. Since you have assessed yourself, you know your value. You may also see Budget Analysis Template. When your source of income (other than PAYE income) commences, you must inform your local Revenue office. This can be done by completing Form TR1-Tax Registration form. This is for an individual, Sole Trader, Partnership, Trust and Unincorporated Bodies. 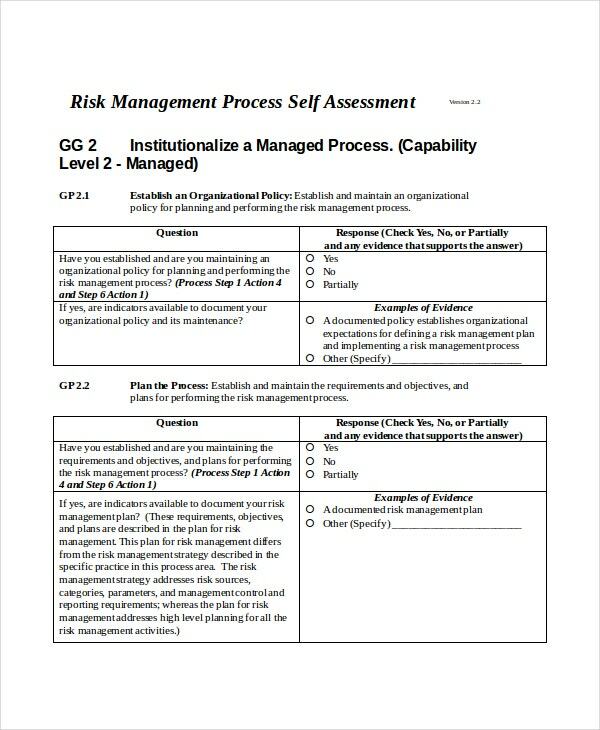 You will automatically get registered for PRSI purposes with the Department of Social Protection when you register for Self Assessment with Revenue.You may also see Lesson Plan Template. Self Assessment Tax, as the name suggests, is the tax which the tax payer computes personally before depositing with the government. The Self Assessment Tax is paid before the income tax returns are filed. Challan No. / ITNS 280 should be presented with the Self Assessment Tax to be paid. It can be paid through any authorized bank or even Online. Computation of this tax is explained below.You may also see Training Assessment Form. Whether it’s a huge company or an individual, everyone needs Self Assessment. They do it to assess their value, determine their goals and manage future risks. There are many different techniques used. 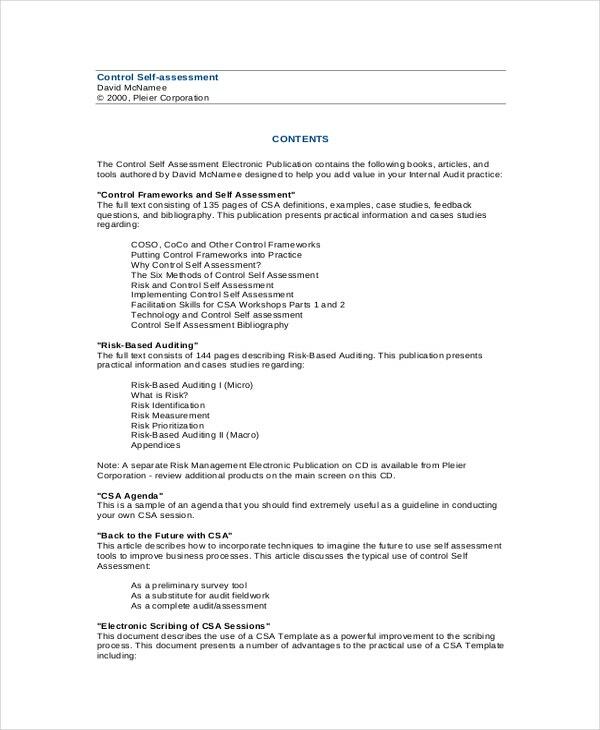 Professionals use their Professional Self-Assessment technique and companies do it through Impact Assessment which helps them to measure the efficiency of their organization.